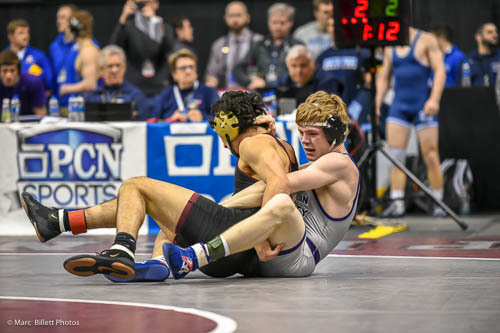 Two Pennsylvania freshman wrestlers who had strong scholastic seasons made headlines in Virginia Beach at the NHSCA Freshman Nationals. Overall Pennsylvania had two individual Champions and 18 total medalists in the Freshman Division. At 152 pounds Mifflin County rookie Trey Kibe won the National title in a weight that was dominated by Pennsylvania. After downing fellow PIAA State Qualifier Lenny Pinto (Stroudsburg) in the quarterfinals, Kibe took out 2018 PIAA State Medalist Cole Spencer (Pine-Richland) in the finals by a 2-1 score. Thanks to a second period reversal Kibe was crowned Champion over Spencer while Pinto bounced back for third place. PA Power Wrestling’s overall Top Incoming Freshman of 2018 was Wyoming Seminary rookie Cole Rees an Erie native. Rees saw varsity action on and off for the National Prep power Wyoming Seminary but made the most of his appearance in Virginia Beach taking the crown at 160 pounds. Northampton Area rookie Jagger Condomitti advanced into the Championship finals at 132 pounds where he finished as the runner-up, falling 1-0 in the finals to Connecticut’s Justin Mastroianni. Southern Columbia’s Patrick Edmondson and Cael Crebs (Montoursville) each took third, Edmondson at 113 pounds and Crebs at 132 pounds. View the place winners below.